Edible Flowers. Microgreens. Peaches. Cashews. Eating flowers. It is pretty unforgivably bougie. I agree. However, it's worth the splurge every now and again, because many flowers are secretly delicious and amazingly nutritious! As a general rule of thumb when it comes to eating plants, the more vibrant the colors are, the more phytonutrients, vitamins, and minerals will be packed inside. Flowers do big, bold color exceptionally well, so don't feel guilty tossing a few petals on your plate. Be smart about it though—not all flowers are in the mood to be eaten; don't just raid the garden (or, in my case, the landlord's planters and hanging baskets) willy-nilly. RN and author of Herbs for Life, Linda Mix, provides a great list of edible flowers here. 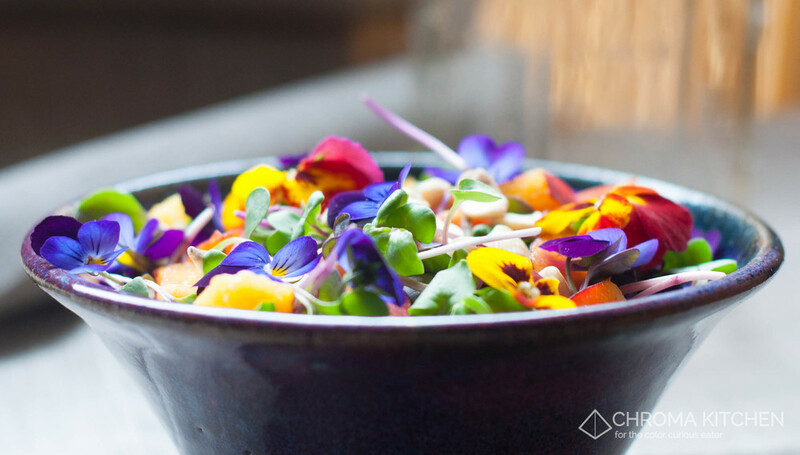 This simple spring salad recipe is a nutritional powerhouse, featuring sweet peaches on a bed of spicy radish microgreens topped with violas, pansies, and raw cashews. The violas, pansies, and microgreens came to me by way of rooftop farm Brooklyn Grange. If you are what you eat, then you might as well eat flowers. Serves two. Eat with a friend. Assemble: Toss microgreens, peaches, and cashews in a bowl. Dress with olive oil, vinegar, and sea salt. Celebrate: Garnish with violas and pansies. Microgreens: Both flavorful and adorable, these tiny leaves are generally harvested just one or two weeks after germination. The United States Department of Agriculture reports that the vitamin and carotenoid content of microgreens tends to be up to five times greater than their mature leaf counterparts. A little bit of leaf. A whole lot of power. Edible Flowers: Petals are not just a decadent way to beautify your plate--although it certainly makes quick work of that. Where color is vibrant, micronutrients are almost certainly in abundance. Find a comprehensive list of edible flowers here. Peaches: As fruit so often is, peaches are up on their fiber game! Vitamin A (good for your vision), potassium (good for your heart), and flavonoids (good for reducing free radical damage to your cells) also come bundled in this fuzzy orange package! If you were able to purchase an organic peach, leave the skin on to increase the antioxidant content of this dish. Cashews: These kidney-shaped 'nuts' are actually seeds! They contain not only heart-protective monounsaturated fat but also a wild amount of copper--1/4 C cashews is 98% of your daily value of copper, which is a potent antioxidant and a key nutrient for iron-utilization as well as bone and connective tissue development.